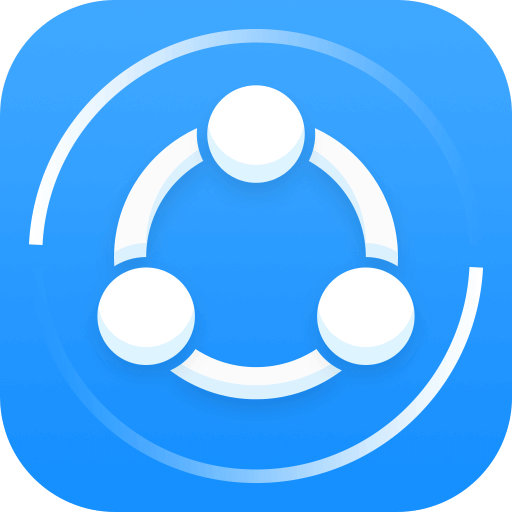 SHAREit is among the most popular cross platform file transferring app, it is now making an entirely new Universal Windows app, which will come to the store soon. 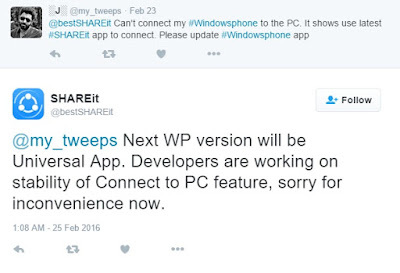 This is excellent news for all users using Windows devices, as the recent update of SHAREit Desktop app, does not connect with Windows Phone SHAREit app, as it is asking for a new update in order to connect with the Desktop. The company has recently gone on to reply to a question on twitter stating that the they are developing a new Universal app which will remove this particular connectivity issues which the users are facing. SHAREit is a wonderful application, which would allow you to transfer your files between devices within seconds. This application will be able to transfer your entire file, for example your family photos, your music, etc, from your phone. It is extremely simple to use, all you need to do is click on “send” or “receive”. Photos, music and video easily to share with friends at any time, having fun with friend. Equipments could transfer files as long as they are on the same LAN at any time. Without LAN？ Equipments connected to hotspots that created by one of them, always could transfer files at any time. Transfer files over hotspots is not using cellular data. Not support transfer files over hotspots that created by Windows Phone. SHAREit can easily be downloaded from the Windows Store. Try it today.